Full-size patterns, or kit, are required to build this boat. It is possible to buy a kit from one of my partners. This plan is presently available in French only. If you would like to order an English version, please get in touch with the architect. Attention : this boat may be built only with a numerically cut plywood kit or with full size patterns. I have drawn many “sail and oars” dinghies, inspired by traditional boats, strong, with timber frames, floorboards and seats. This results in relatively heavy and seaworthy crafts, but not easy to handle ashore. 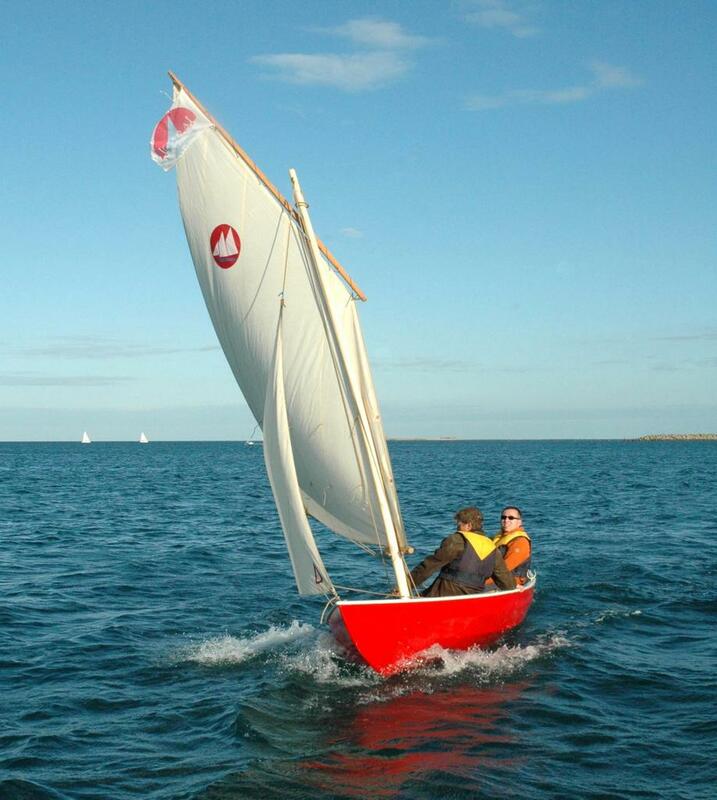 With the Doris 5 m, my aim is to propose a lighter sail and oars dinghy, well suited to today use and also easy to build. As most of my designs, it is intended to both amateur and professional builders. The hull is inspired by American swamscott dories. Due to the overhangs, the hull planks have a very little twist and are easy to set down. Also, there is no need of a bowsprit for the jib. The flat bottom allows the boat to be moved over inflatable rollers. The moderate breadth makes Doris 5 m easy to move under oars. The pivoting centreboard gives excellent windward performances. Lightness results from the use of 6 mm thick plywood for the hull. Only the sole is thicker: 9 mm plywood. Overall glass-epoxy sheathing outside makes the hull very touch and tolerant to chafe. Inside, only sole and garboard are fully sheathed. We use the straightforward stitch and tape building method. There are two frames, made of 18 mm plywood, the visible edge being covered by a timber trim. Two bulkheads, one at each end, makes buoyancy compartments. The hull is assembled in the upright position without any additional mould. There is not any enclosed locker, to save weight but also because I consider more practical to use watertight bags than contorting to extract belongings through a hatch. Some canvas bags may be installed under the helmsman seat. The centreboard is pivoting but may also be extracted as a sabre board, thus having the virtues of both systems. We have made the choice of a standing lug sloop rig with a boomed mainsail. Sail, boom and yard may be put down over the thwarts when rowing. The boom makes the rig more effective. The sloop rig gives a good sail area but with a low centre of effort, well suited to this light hull. The small size of the mast makes stepping easy, even with a solid spar. With the mast stowed partly under the thwarts, it is possible to make long passages under oars. According to the intended use, it is possible to have two or only one rowing thwart. With two thwarts, the aft one may be moved to get the best trim according to the crew. A sprit rig may also be drawn on demand. Be the first to review “Doris 5 m” Click here to cancel reply.